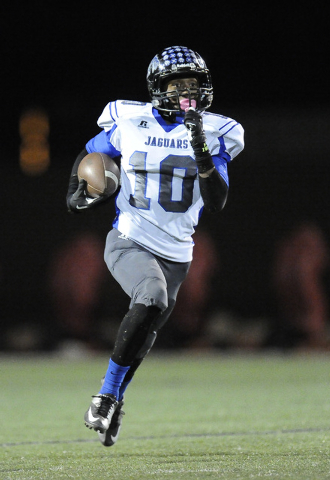 Desert Pines senior Jon McCoy didn’t get a whole lot of opportunities to touch the ball during the Jaguars’ Division I-A state quarterfinal game Friday night at Faith Lutheran. 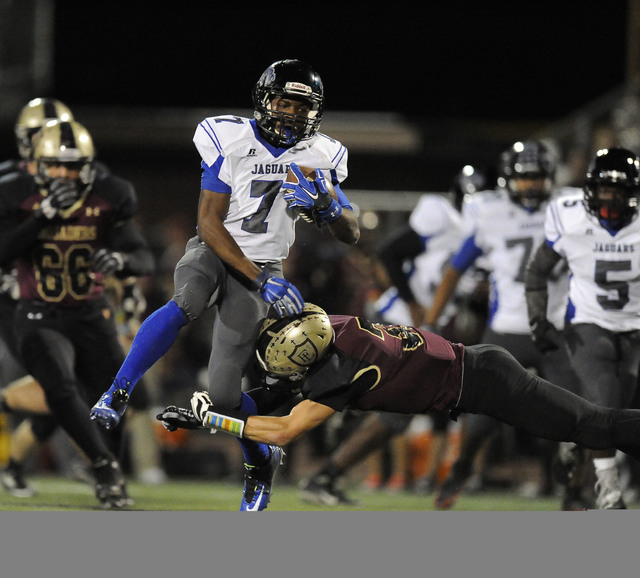 He certainly made the most of the chances that he did get as Desert Pines (10-1) advanced with a 34-27 road victory. McCoy ran for 19 yards on a fake punt to convert a fourth-and-7 from the Crusaders’ 43-yard line with less than six minutes remaining and the Jaguars trailing 27-26. Four plays later, Trevor Nofoa ran for a 1-yard touchdown and added a successful 2-point conversion run. 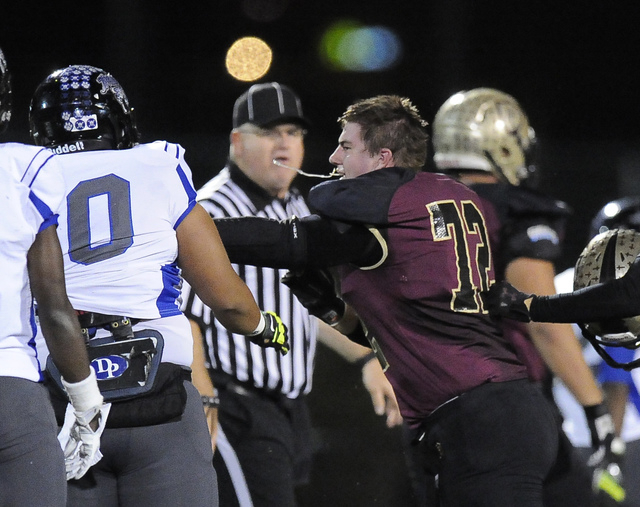 Faith Lutheran (7-4) drove inside the Desert Pines 5-yard line, but Christian Marshall was stuffed on fourth-and-2 with 2:19 to play, and the Jaguars ran out the clock. 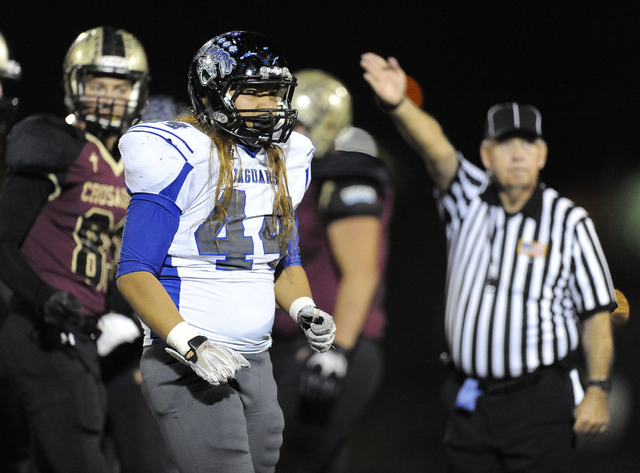 Desert Pines coach Tico Rodriguez didn’t call a straight fake punt. “It’s an option play. If he doesn’t have it, he kicks it,” Rodriguez said. “He saw something on the back side, so he cut it back. It’s not how we drew it up, but when you have kids that are great athletes, sometimes they make plays. McCoy rolled right as he scanned the field before cutting all the way back to the left to keep the decisive drive alive. “Basically, I can either look for an open receiver or just take it. I saw the whole left side of the field open, so I just went,” he said. “If it came down to it, honestly, yeah I would have punted if I had to. 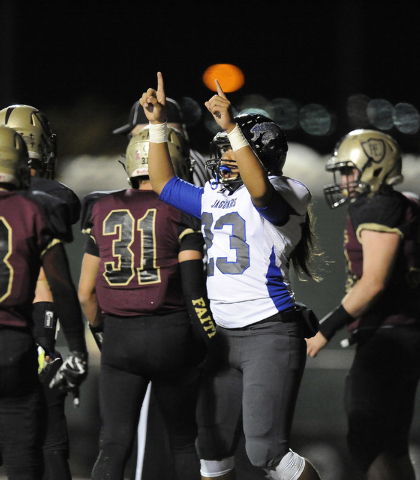 After a thoroughly dominant first half in which Desert Pines gained 266 yards on 48 plays to just 90 yards on 17 plays for the Crusaders, the Jaguars found themselves leading just 14-13 after Faith Lutheran scored on a long pass and a long fumble return for a touchdown in the final three minutes of the second quarter. The Crusaders kicked off with 26 seconds remaining before halftime, and Dillard Davis ran into a pile before somehow finding McCoy and pitching him the ball. McCoy emerged from the group and sprinted 73 yards down the right sideline for a score. On the stat sheet, McCoy recorded just two rushes for 21 yards and caught one pass for 12 yards. His impact was far more significant as he helped Desert Pines advance to a 1 p.m. meeting with Churchill County at 1 p.m. next Saturday. Nofoa ran for three short touchdowns, and Isaiah Morris carried 32 times for 168 yards and a TD in the victory. 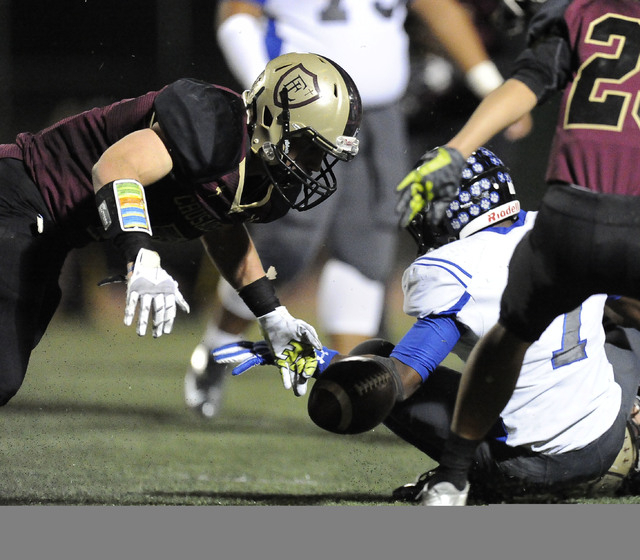 Mark Rubalcaba caught five passes for 151 yards and a touchdown for Faith Lutheran. He got open deep for a 61-yard score with 2:47 to play in the first half. Until that point, the Crusaders had gained just 30 yards on 14 plays. 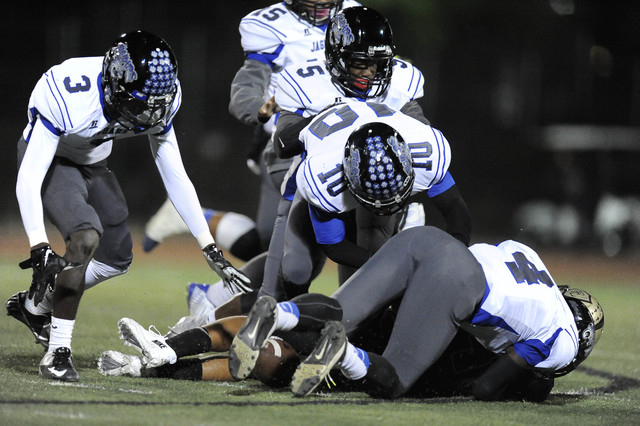 Desert Pines’ ensuing possession ended on a botched snap that Alfred Soboyejo IV picked up and ran 60 yards for a score, setting up McCoy’s heroics just before halftime. ■ Basic 28, Canyon Springs 17 — At Canyon Springs, Josh Villaros caught five passes for 131 yards and two touchdowns to lead the Wolves (5-5). Villaros outraced the defense on a 61-yard end around for a score on the Wolves’ first possession of the second quarter. Mason Hiedeman recovered a fumble on the ensuing Pioneers drive, and one play later Villaros added a 40-yard touchdown reception on a halfback pass from D. J. Thomas. Basic extended the lead with a nine play, 80-yard drive capped by an incredible Villaros catch for another 40-yard score, this time from quarterback Aeneas McAllister. Villaros streaked down the right side and tipped the pass to himself at the 5-yard line, breaking two tackles before scoring his thrid touchdown. ■ Coronado 20, Silverado 7 — At Coronado, the Cougars got all the points they needed in the first quarter. The game looked like it could be a rout early, as Coronado (7-3) jumped out to a 13-0 lead in the first quarter thanks to a 2-yard touchdown pass from Spencer Cofer to Kainoa Granstrom and a 22-yard score by Tanner Gorski on a lateral swing pass. But Silverado answered with a 60-yard touchdown throw from Mitchell Ballard to Addison Lyon. Coronado got its lead back to double digits later in the quarter on a 20-yard touchdown run by Nick Trejo, but that was the end of the scoring. Trejo finished with 87 yards rushing for Coronado. ■ Arbor View 40, Shadow Ridge 24 — At Arbor View, the Mustangs struck first, but the Aggies quickly turned the game around and rolled in the first round. Shadow Ridge (3-7) executed a perfect onside kick to put their offense on the field first, but the Mustangs had to settle for a 25-yard Chris Mendoza field goal. Denajiou McZeal took the Aggies’ first offensive play 44 yards for a touchdown. Arbor View (10-0) then capped a 10-play drive with an 11-yard run by Charles Louch. Herman Gray then intercepted a pass and on the next offensive play went 48 yards to make it 21-3. ■ Palo Verde 42, Cimarron-Memorial 12 — At Palo Verde, senior Jaren Campbell led the charge for Palo Verde (7-3) with 173 yards on 13 carries, including three touchdowns. Junior Aaron Chisolm had 112 yards on 11 carries, including a 92-yard TD run. After going into the locker room with a slim 13-6 halftime lead, the Panthers scored on their first two possessions of the third quarter to open up a 28-6 lead. Derek Morefield completed 7 of 21 passes for 133 yards and two touchdowns for the Spartans (4-6). ■ Bishop Gorman 63, Desert Oasis 0 — At Bishop Gorman, the No. 1 Gaels (11-0) dominated in all three phases of the game and scored touchdowns on their first eight possessions for an easy shutout of the Diamondbacks (2-8). Danny Hong completed 10 of 11 passes for 147 yards and two touchdowns for the Gales, while Tate Martell connected on a 40-yard TD strike to Alize Jones to open the scoring. Jones caught three passes for 69 yards and two touchdowns, including an 8-yarder from Hong. Biaggio Walsh led the ground game with 101 yards on nine carries, scoring twice. Russell Booze rushed for 84 yards, including a 59-yard touchdown. ■ Centennial 41, Legacy 13 — At Centennial, Centennial quarterback Juan Rodriguez threw for 143 yards and three touchdowns and ran for 90 yards and another score for the Bulldogs. The Bulldogs (9-1) scored 24 straight points. Rodriguez threw the first of his three touchdown passes when he connected with Ivan Ochoa-Serrano on a 36-yard scoring strike. Rodriguez extended the Bulldogs’ lead to 24-7 when he rushed for a 30-yard score. 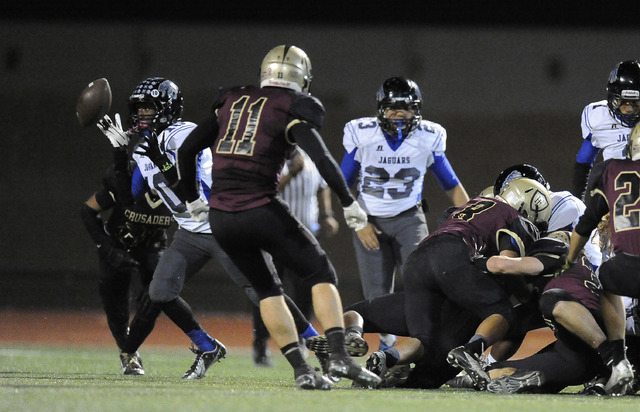 The Bulldogs first-half onslaught continued when Rodriguez hit Kevin Wiesner on a 27-yard touchdown pass. DeMichael Walker ran for 191 yards and one touchdown for Legacy (3-7). ■ The Meadows 16, Needles 7 — At The Meadows, a defensive stand in the red zone helped The Meadows advance. Trailing by six, Needles drove to The Meadows’ 8-yard line with 5:20 left in the fourth quarter. On fourth down, Needles quarterback William Dunn threw to an open receiver in the end zone, but the ball bounced off his hands. The Meadows drove to Needles’ 3-yard line, where Sander Straus sealed the win with a 20-yard field goal with 1:47 left. Jack Berkley fueled the drive with a 39-yard run. Berkley finished with 27 carries for 139 yards and a touchdown, while Jacob Gleason went 7 for 9 for 107 yards and a touchdown for The Meadows (9-2). ■ Agassi Prep 20, Lincoln County 12 — At Rancho, Kobe Williams scored two touchdowns and intercepted two passes to lead the Stars to a first-round win. 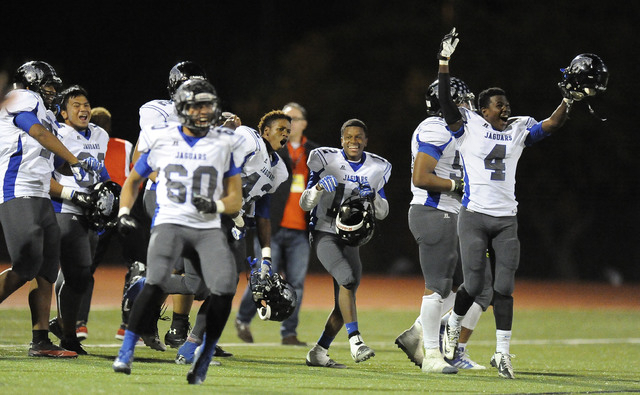 Williams returned his first intercepion 44 yards for a touchdown in the first quarter, and his second interception occured in the end zone on the last play of the game to seal the Stars’ victory. Costly mistakes plagued the Lynx (6-4). A fumbled snap led to a blocked punt, which led to a 5-yard touchdown run by Stephan Lauschaul. Later in the half, an interception on the goal line by Cajon Lakes started Agassi Prep (8-2) on a 78-yard drive capped by Williams’ 21-yard TD run. Williams and Lauschaul each finished with 98 yards rushing. ■ Spring Mountain 74, Beatty 22 — At Spring Mountain, Cory Duncan gained 174 yards of total offense Friday to help Spring Mountain defeat Beatty. Duncan caught four passes for 101 yards and a touchdown and ran eight times for 73 yards and a score. Nick Meyers carried 16 times for 92 yards and a touchdown, helping the Golden Eagles (8-2) outrush Beatty 282-35. The Golden Eagles sacked quarterback Luis Flores eight times. ■ Pahranagat Valley 60, Sandy Valley 0 — At Alamo, Wade Leavitt had 103 receiving yards, 71 rushing yards and three total touchdowns as the Panthers (10-0) cruised past the Sidewinders (6-4). Tabor Maxwell was 11 of 15 for 173 yards and three TDs for Pahranagat Valley, and teammate Jordan Cryts had seven carries for 70 yards and two scores. Shawn Wadsworth scored on a 3-yard rushing touchdown and had two receiving scores for the Panthers.